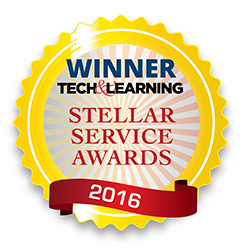 AVer picks up another Tech & Learning's Stellar Service Award and this time for Best Sales Support in 2016. This will be AVer's second year in a row of receiving recognition for exceptional customer service. In the previous year, the company received the Stellar Service Award for Best Tech Support. "On behalf of AVer, I would like to thank all of our customers for providing our team the opportunity to give support and ensure the best product experience. It is an absolute honor to receive this award and the truth is that without our customers, we would not be able to do our job,"
stated Dave Elston, Sales Operation Manager of AVer Information Inc. Americas. This award recognizes the service and support that customers receive as part of the AVer product experience. When investing in AVer products, customers are also investing in the team of people that stand behind it. AVer's Sales Support Team is not only technology savvy, but is professionally trained to provide exceptional service and support. AVer offers product training and onsite services to guarantee the best product experience for each and every customer. AVer's sales support staff is comprised of many helping hands and is not limited to operations, marketing, R&D, product managers, accounting, IT support, and warehouse teams. It's all on hands on deck. AVer is committed to customer satisfaction beyond product purchase and life of the product. The company's commitment is lifetime guaranteed as the AVer team continues to evolve their support through their commitment to providing innovative technology solutions for the present and the future. AVer staff go above and beyond to address questions and concerns with the most reliable and efficient solutions. AVer's extensive web support with US based live chat, e-mail, and phone services are backed with friendly service-oriented experts. Tech & Learning plans to formally present the award next year in Austin, TX at TCEA 2017.